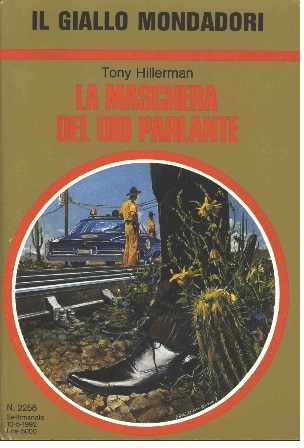 This edition is a reissue of the 1991 Italian edition of Talking God, the ninth book in Tony Hillerman's Navajo Mystery Series. This 1992 edition was published by Arnoldo Mondadori Editore in Milan, Italy. This edition was published as part of the Il Giallo Mondadori (the yellow Mondadori), a series of weekly publications produced by the Mondadori publishing house. The series has a two column format. This edition, number 2258, was printed for readership for the week of October 5, 1992 and contains a short biography of Tony Hillerman as the Author of the Week at the end of the book. The text was translated from English into Italian by Stefano Negrini and the cover was designed by Prieto Muriana (Agenzia Norma). Binding: Paper covers with full color illustration and black and white advertisements printed on the inside covers. The author's name, title and the edition number is printed vertically in black on the spine.